The trend in certain pro apps is to use multiple GPUs to render projects. One of our frustrations with "super charging" the 2009 - 2012 Mac Pro to do that well is that it only has two 16 lane PCIe 2.0 slots. And if you put two "double wide" or "thick" GPUs in those slots, you are left with only one "thin" 4 lane slot. Five GPUs = GeForce GTX 680 inside slot one of the Mac Pro; Dual GeForce GTX 580 Classifieds and Dual GeForce GTX 770s inside the Cubix Xpander Desktop connected to the Cubix Host Interface Adapter in slot two of the Mac Pro. Four GPUs = GeForce GTX 680 inside slot one of the Mac Pro; One GeForce GTX 680 and Dual GeForce GTX 770s inside the Cubix Xpander Desktop connected to the Cubix Host Interface Adapter in slot two of the Mac Pro. "Test Mule" was a 2010 Mac Pro 3.33GHz Hex-core. OctaneRender is a "GPU only" standalone renderer that can process scenes created in and exported from Maya, ArchiCAD, Cinema 4D, etc. -- and does so in a fraction of the time it takes with a CPU based renderer. However, currently it only works with CUDA capable NVIDIA graphics cards. The DEMO comes with a scene called octane_benchmark.ocs. For our test we selected RenderTarget PT (Path Tracing). The render time is tracked and displayed in total seconds. The first graph features 32 nodes of blur effect. Note that the Four and Five GPU setups meet or exceed the 25 FPS target speed. We confirmed that all installed GPUs were used to render the nodes on the fly. The Cubix Xpander provides an impressive boost in three out of four examples of GPU accelerated pro apps. It as gives a temporary advantage to the Mac Pro tower over the soon-to-be-released Mac Pro "tube." Why? Because there is no spare PCIe slot in the 2013 Mac Pro for the Host Interface Controller required by the Xpander. You are limited to two factory AMD FirePro GPUs that do NOT support Ray-traced 3D in After Effects nor OctaneRender. No drivers or patches were required to use the Xpander. It was truly plug and play using an industry standard Host Interface Controller (HIC) to connect the Xpander to the Mac Pro's second 16 lane PCIe 2.0 slot. The price of the four bay Xpander Desktop Elite about $3000 -- without any GPUs. So if you don't already own four high-end GeForce GPUs, your total investment with the purchase of the four GPUs will be more like $5500. Order it with four Quadro K5000s and you are up to around $11,000. 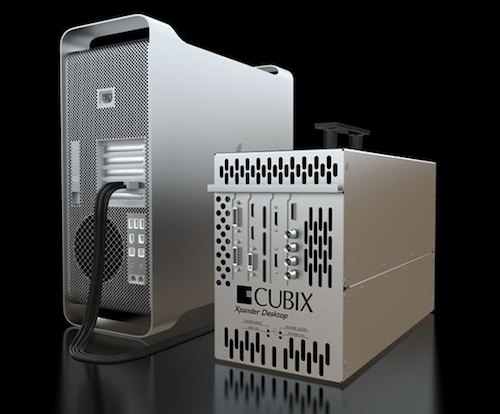 The Cubix Xpander is a cost-is-no-object solution for pros looking to significantly reduce GPU rendering time for apps like OctaneRender and DaVinci Resolve. The model we tested was the Xpander Desktop 4. The current models are called Xpander Desktop Elite. The main difference is the replacement of the LEDs on the front panel with an LCD display. And it offers a variable speed temperature sensitive cooling fan. You can also order an Expander Rackmount and well as Expander for Laptops. Though we used the Xpander exclusively for GPU testing, it can also be used for other kinds of PCIe adapters. The 4G GeForce GTX 680 we tested can be purchased from Mac*Pro. The Radeon HD 5770 and 5870 is available from OWC and Apple Store USA. A flashed Radeon HD 7970 is available from MacVidCards. USA readers can help us earn a commission by using this Apple Store USA link or by clicking on any Apple display ad. For GPUs, click the left side bar option for "For Mac > Displays & Graphics" to find the GPU kits available. Or if you are buying a new Mac Pro, you can choose GPU options when you configure your order. For UK readers, visit Apple Store UK.